What a glorious day for the barbie – a bit warm but a little bit of a breeze blowing. The event was a very relaxed one – with probably around 50 people of all ages and vintages. To see the FPV and heli guys looking quite at home at their ‘new’ field and then the fixed wing guys sharing planes and in general discussions about all things modelling is a fantastic image for our club and our sport. Jodie and Ian put in a huge effort to cater for all. We suggested they should go into a side gig of doing catering for functions. We had sausages, ham, pork, roast – all cooked on our barbeque as well as a rented barbeque from the local butcher and on a Webber. Everyone agreed – the meat was delicious. Then there were the various salads, coleslaw and fresh bread. There was plenty of food, chatter and sipping of soft drinks. 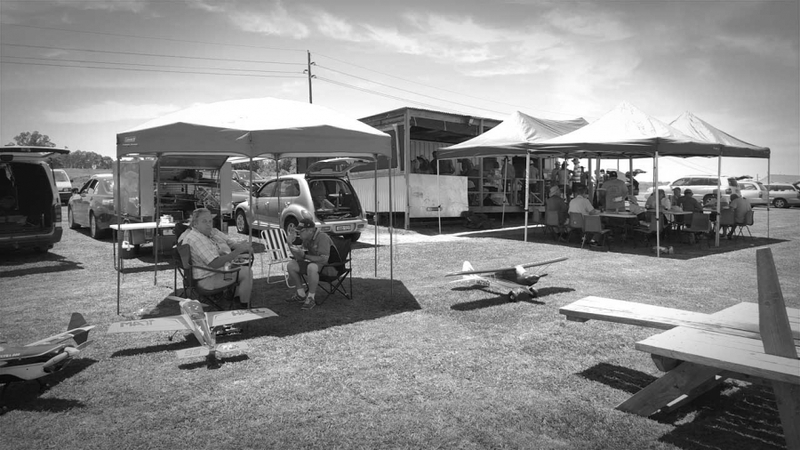 Talking about times of old and the great future New South Wales has in aeromodelling in 2016. Some people commented that they could just lie down and have a cosy arvo nap. Others went off to do ‘just one more circuit’. Thank you Jodie and Ian – for being great mates and for all your hard work to bring this together – allowing others to have a wonderful time of eating and camaraderie. Merry Christmas and a Happy New Year to all our HMAS members and the wider aeromodelling community. May the winds of change in 2016 be all that you wish for.